Do you make your Valentines or buy them? I do a little of both. 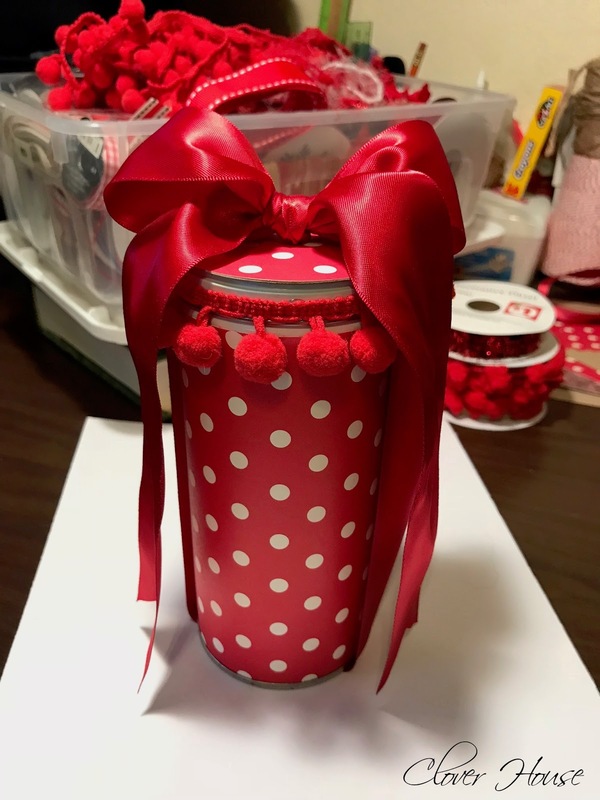 My honey has a favorite candy, Ferrero Rocher, and I always like to get that for him on special occasions, but I like making him something special too! 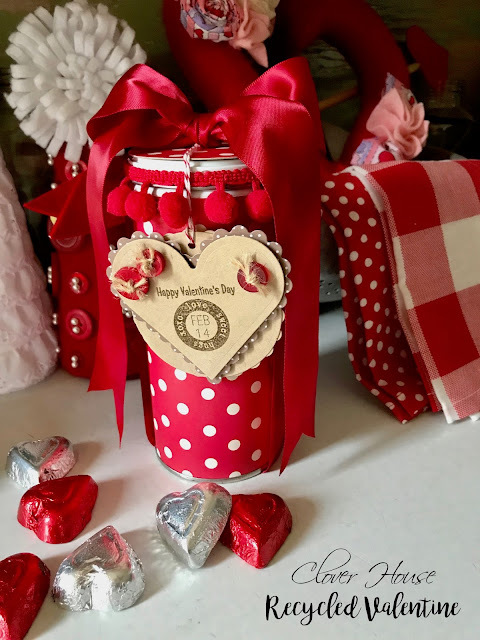 Let me show you how to make this sweet gift from a recycled tin and a few other recycled items too. 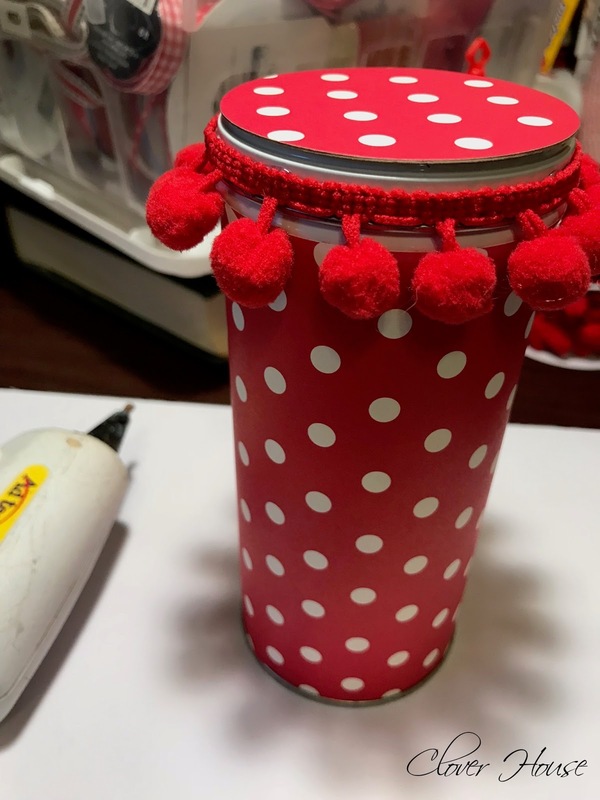 I have fond memories of making a Valentine box for school each year. I always loved that project, but anything crafty was right up my alley! This project brings back those memories! Remember my Cocoa Station (click here) that I created back before Christmas? 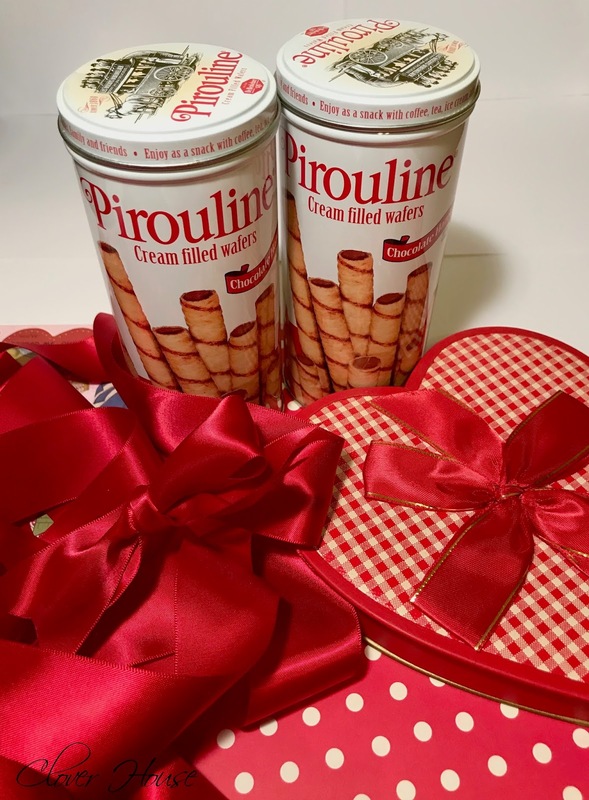 Well, we ate LOTS of these yummy little Pirouline Cream Filled Wafers Cookies and I kept several cans to do crafts with. I also saved ribbons from some of my gifts. See that cute little vintage Valentine candy box up there? That was a gift from my Mama. She always saves stuff through the years and then she comes across them later on and then she shares with ME! Ok, on to the project! I'm a card maker so I have tried lots of adhesives through the years. The red line tape you see here is the best sticky stuff for when you're not just using paper on paper. It's a two sided adhesive. 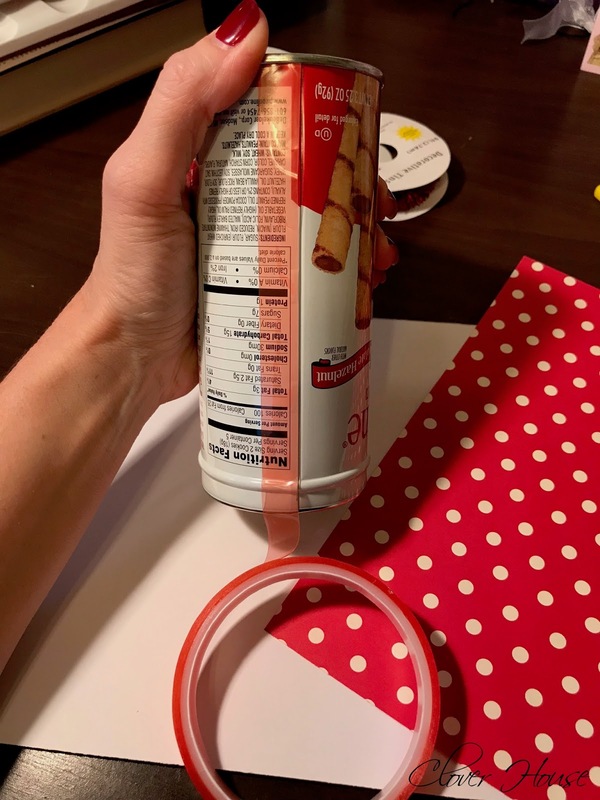 This tape is super sticky so be sure you mean it when you add your paper! This tape will be very handy when recreating my recycled tin project. 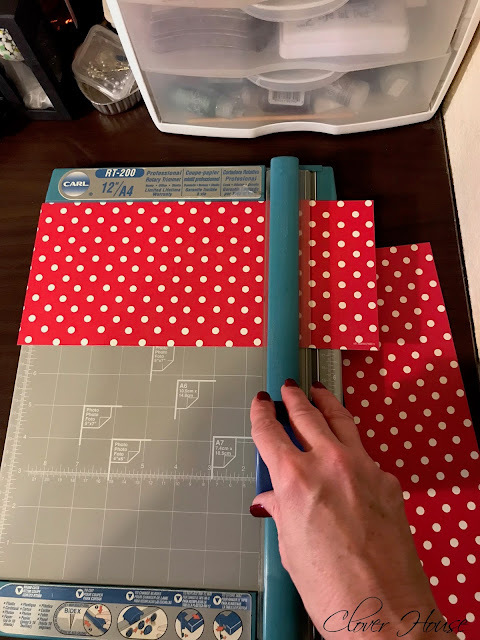 Pick out your scrapbook paper and cut it at 5 1/4" x 9 1/4". You'll want to use a pretty sturdy paper (like card stock thickness) for this project. 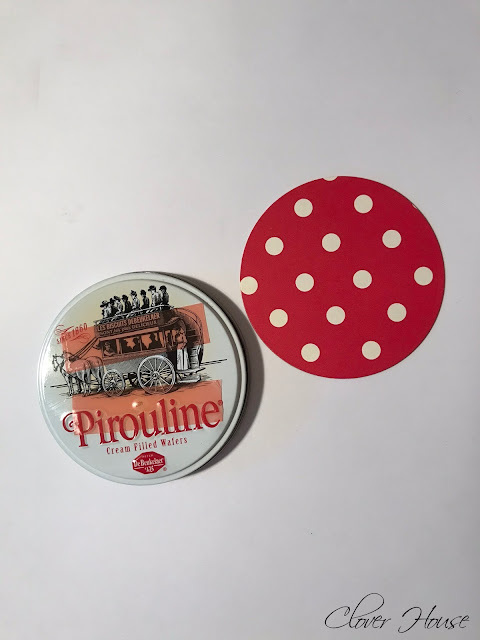 Place one strip of the red line tape along the seam of the tin. Cut to length. Take off red plastic to expose the other side of sticky. 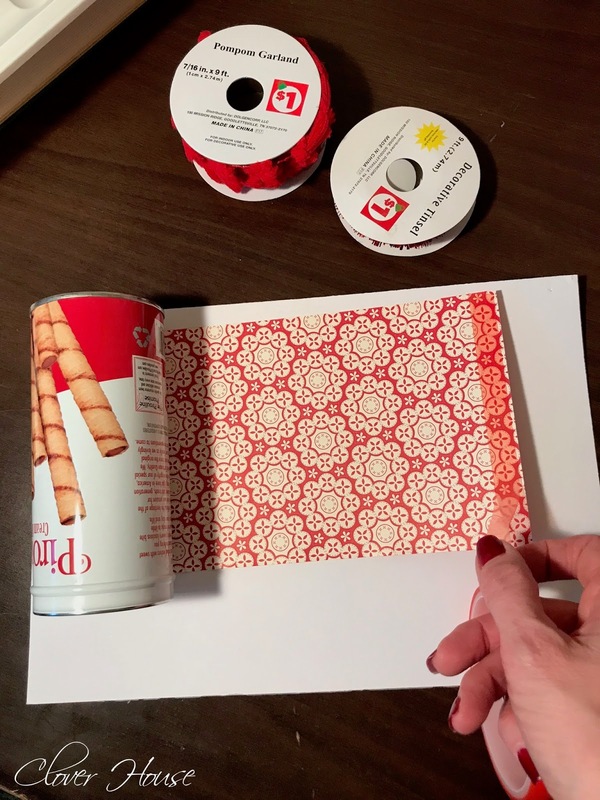 Add the paper to the sticky tape already on your tin. Now add one more strip of tape to the other end of your paper. Wrap your paper around your tin being careful to keep it straight and tight as you go. Hold in place like so while you take off the red plastic strip to adhere it all together. 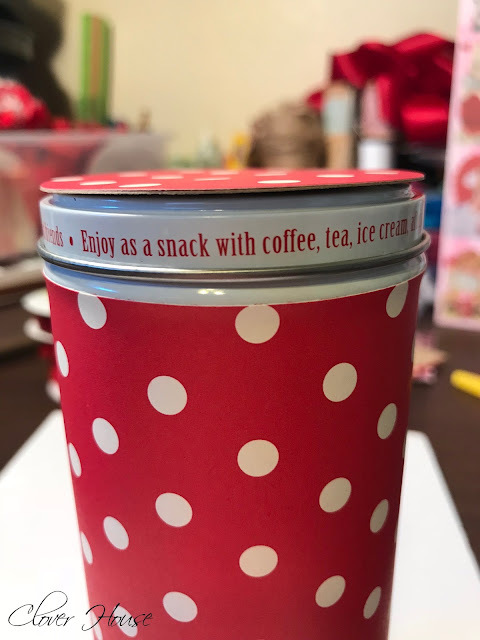 Set tin aside. Now you need to cut out a circle for the top of your tin. I used my circle Spellbinder Nestabilities dies, but you can also just trace around the lid and cut it out by hand. Add two more strips of tape to the top of the lid and adhere the circle to it. Now what to do about these words left showing. 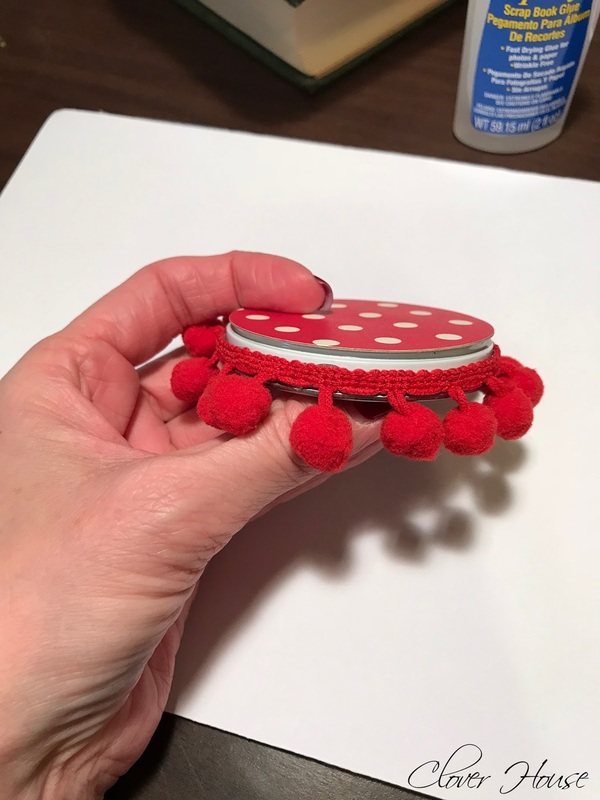 Pompom trim is good but you can also add a strip of paper or even some thin ribbon as well. I used my hot glue gun on low when I added the pompom trim. Now to fill it up with the fun sweet treat. I picked up some chocolate hearts to add to mine. I added a few strips of Valentine tissue paper first, then the chocolates. Now tuck in the tissue paper ends and replace the lid. Next I grabbed a piece of my red ribbon (1-1/2" wide by 36" long) that I'd saved and tied the whole thing up pretty! I wrapped it all the way around so it would be easy to remove. I tied a big ole pretty bow on top. Some might say that this is NOT a masculine gift, but hey, Valentines to me are pretty, red and very fancy! 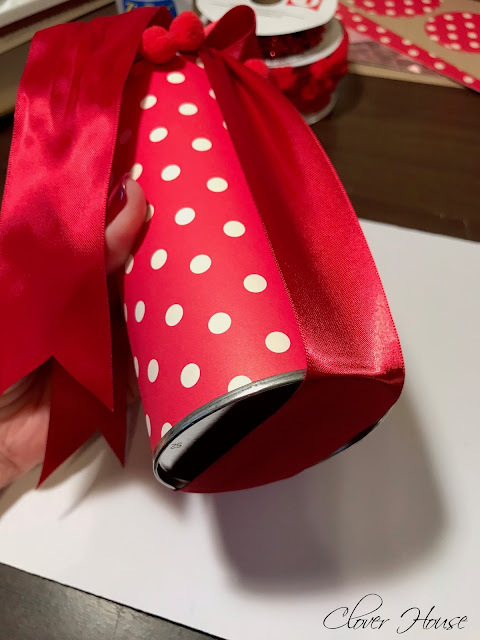 TIP: If you are recycling your ribbon and its all wrinkled from being already tied once, just grab your flat iron and smooth it out all nice and straight again. 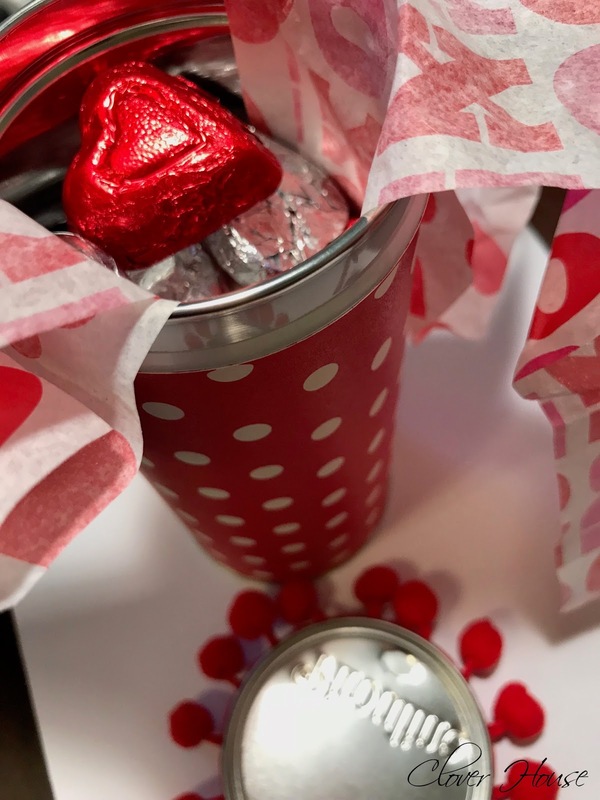 Lastly, add some type of tag or card that you can write a sweet note on and you're ready to give your Valentine a wonderful gift that didn't cost hardly anything! The tin was free, the ribbon was free and I got the rest of the items I used out of my giant card making craft stash. FREE!!! I love free. Now all I need to do is make a Valentine card and I'm all ready for Valentine's Day! Would you like to see a recycled card I made too? Click link below. If you'd like to see MORE RECYCLE IDEAS click on links below. How fun! Using the can for Valentine's treats is such a great idea. I saved several of those same cans from the holidays. 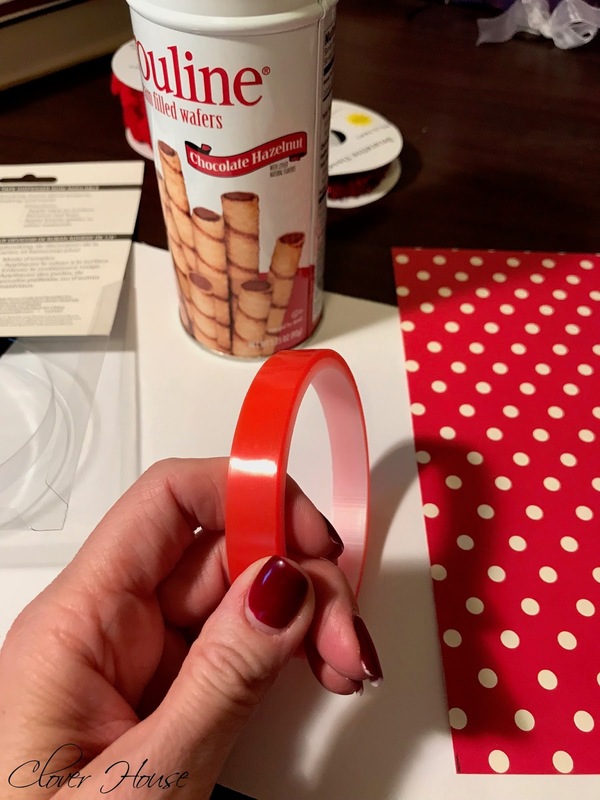 Thanks for sharing your fun idea with us at Snickerdoodle. Pinning. Thank you so much Beverly, I hope you make yourself a Valentine or two! You're welcome! 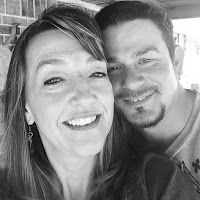 I'm popping back by to let you know I featured your lovely Valentine at this week's Snickerdoodle Party. That is so cute! I make handmade cards for my boys and husband but never thought to personalize their gifts too. Pinned. 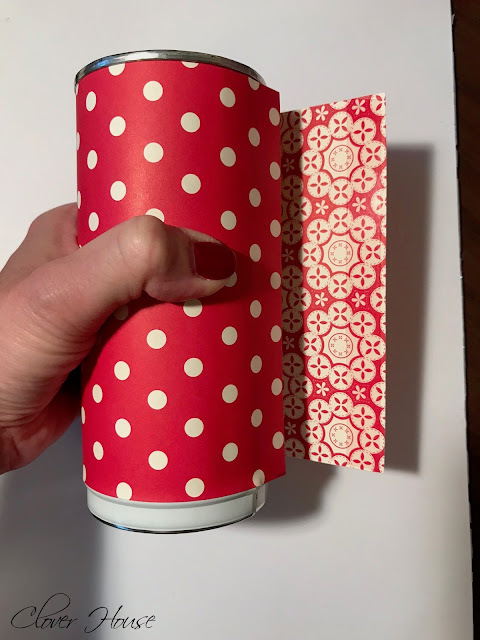 I love using tins as "gift wrap." We used to consider it a "good" Christmas if we filled the woodstove 4 times with wrapping paper. Now I use a lot of homemade cloth gift bags and tins with pretty designs. I have been saving colored paper and pictures from boxes and mail for years for card making and scrap booking. Even just punching lacy circles from colorful floral ads is gorgeous--and the price is right! I use lots of floral pictures from bulb/seed catalogs for cards. I have made tiny quilt pictures by cutting, then piecing narrow strips of the cloth bolts in Joann's fliers! My favorite upcycled "tin" is the brown plastic box from Hershey's cocoa; it is just the right height for 4" glue sticks! What a cute idea!This is really pretty and what a great gift! Thanks for sharing at Celebrate It!